Anybody that follows my blog knows by now that we love salmon prepared in any which way. After all, this is 19th post featuring salmon! As is the case with many salmon dishes the prep takes a lot longer than actual cooking. I always cook my rice an automatic rice cooker so I usually start with washing the rice. By the time the rice is done, about 25 minutes, the meal is ready to be plated. Start by preparing the sauces. In this version I served wasabi-mayonnaise sauce made by mixing 2 tsp. of wasabi paste with 3 Tbs. of mayonnaise. Second sauce is simplified teriyaki sauce: 2 Tbs. Kikkoman soy sauce, 2 Tbs. sake and 2 Tbs. dark honey (I prefer buckwheat honey) or maple syrup. Mix until well combined. 1) Seedless cucumber slices cut in half and pickled in mix of 1 tsp. of rice vinegar and 1 Tbs. of dark honey. Let marinate in bowl and then drain in colander just before serving on same plate as salmon and asparagus. 2) Asparagus cooked in microwave for 1 minute on high, tossed with butter and then sprinkled with coarse sea salt and freshly ground white pepper. Since I serve the salmon with crispy skin (the best part of whole dish) the skin must be completely free of scales, and I mean not a single scale regardless how small it is. Scaling the fillet is by far the most tedious job that takes most of the prep time. But, once done it takes just 4 – 5 minutes to cook the salmon. Start by heating non-stick frying pan on high with 1 tsp. of peanut oil and 1 tsp. of sesame oil. When light smoke forms above the pan carefully place the fillets skin side down. Cook on high until you see about 1/4 of the fillet above skin turning from pink to creamy color. Lower heat to medium high and turn fillet on flesh side down. Continue cooking till about 1/4” of the flesh in middle is still pink. Add the “teriyaki” sauce and reduce for 30 seconds. 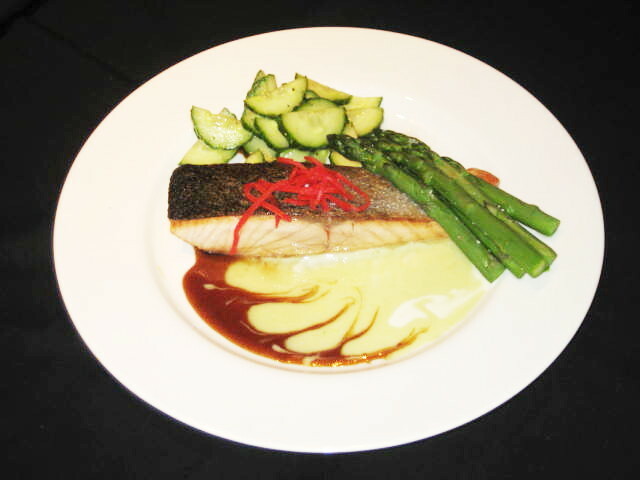 Remove the salmon immediately to preheated plate skin side up, pour wasabi-mayo sauce next to fillet followed by reduced teriyaki sauce. Place the asparagus and drained cucumber salad on plate and serve. The skin comes off in one straight and crispy piece. What a treat!